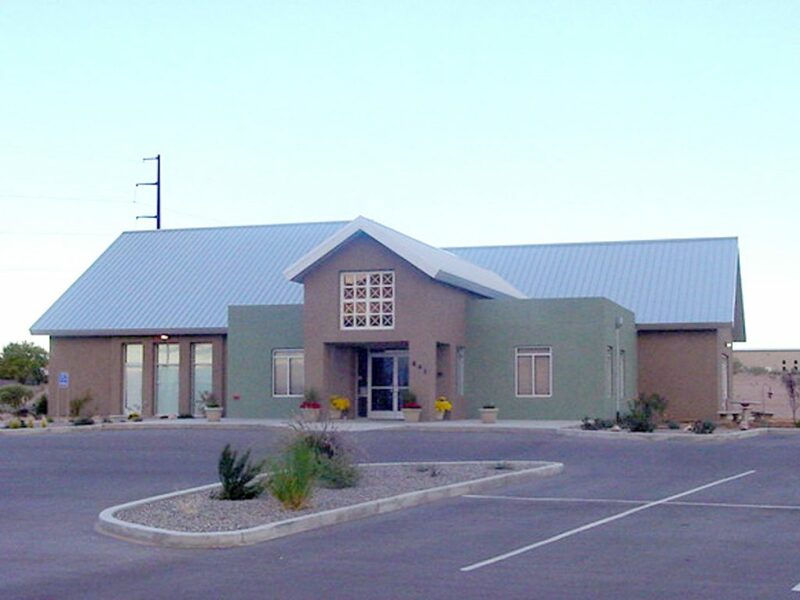 The Community of Joy Lutheran Church congregation was young when it bought five-and-a-half acres dotted only with sage in northeastern Rio Rancho to make its home. Out of the sand grew a four-phase comprehensive master plan for the congregation’s needs and anticipated growth – beginning with a 6,400-square-foot Sanctuary and social hall that opened in 2004 and additions in 2007. The church was designed facing the east, located on the high side of the sloping site to easily be seen from the busy street below. The location of the front door offers awesome unencumbered views of the Sandia Mountains and creates a wondrous backdrop for outdoor worship services. The exterior design and massing of the church is respectful of the scale and rhythm of the single family houses that border the site. With its traditional cruciform plan, the foyer and social hall are at the center of the building with flanking classrooms and Sanctuary. Future additions can be added without changing the basic internal organization.